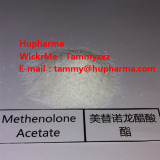 Primobolan Methenolone Acetate Muscle Growth Steroids powder Buy Methenolone Acetate, Methenolone Acetate raw powder, Methenolone Acetate anabolic steroid powder, Methenolone Acetate price, anabolic steroid powder Methenolone Acetate, Methenolone Acetate COA, Methenolone Acetate manufacturer, Methenolone Acetate powder Product Name: Methenolone Acetate CAS: 434-05-9 Purity: 99% Molecular Formula: C22H32O3 Molecular Weight: 344.4877 Appearance: White or white crystalline powder Description: Primobolan (methenolone acetate), all things being equal, is an excellent oral steroid drug. Unlike most other oral steroids, Primobolan is not 17-alkylated and does not have liver toxicity problems. Methenolone is perhaps only half as potent by the oral route as by injection, so dosages need to be high, at least 100 and preferably 200-300 mg per day, but if that can be afforded it is an excellent drug. It is unusual among oral steroids as being Class I, binding well to the androgen receptor. Function: Primobolan is most popular for male bodybuilders to stack Primobolan with other steroids in order to obtain a faster and more enhanced effect. During a dieting or cutting phase, a non-aromatizing androgen like Halotestin or trenbolone can be added. The strong androgenic component should help to bring about an added density and hardness to the muscles. On the other hand (or in addition) we could add Winstrol, another mild anabolic steroid. The result of this combination should again be a notable increase of muscle mass and hardness, but in this case the gain should not be accompanied by greatly increased side effects. As mentioned earlier, Primobolan Depot is also used effectively during bulking phases of training. The addition of testosterone, Dianabol or Anadrol would prove quite effective for adding new muscle mass. Primobolan is regarded by the majority of bodybuilders and athletes as a preferred 'cutting' compound considered very useful for pre-contest cycles and fat loss and cutting phases.